WHAT IS THE PRAIRIE STYLE? THE PRAIRIE SCHOOL was a late 19th and early 20th century architectural style, most common to the Midwestern United States. Their ideas developed in sympathy with the ideals and design aesthetics of the Arts and Crafts Movement begun in the late 19th century in England by John Ruskin, William Morris, and others. Also, in the mid-nineteenth century, the opening of Japan to western trade set off a craze for Japanese designs in Europe. Japanese decorative ideas were later adopted by artists and architects working in the Art Nouveau Style, and in the Prairie School Style. The movement attracted more than a score of young men and women, the best known being Louis H. Sullivan and Frank Lloyd Wright. Their design philosophy was to create a harmonious and restful organic home; a unity of form and colour. The works of the Prairie School architects were usually marked by horizontal lines, which were thought to evoke and relate to the native prairie landscape. Natural materials of wood, brick and stone were predominant and the number of materials was limited. 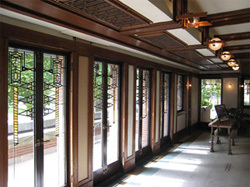 Craftsman-created art glass windows with straight-line patterns suited the characteristics of the glass and metal, and reinforced harmony and unity with the other materials in the interior. When a pattern was used, it was geometric and related to the overall motif of the building. Have a look at our Stained Glass Patterns for Needlepoint Art adapted from Prairie Style stained glass panels. The inherent colours of the building materials certainly dominated and set the tone for all of their decorative schemes. For textiles they chose a muted earthen palette of browns, warm greys, wheat-tones for the background, accented by different greens, rusts, and reds… just as you would see when walking in the woods in autumn. These colours harmonized with the natural materials of the building, providing a calm natural environment to delight the eye. DO THE PRAIRIE STYLE DESIGNS STILL WORK TODAY? 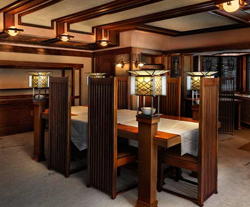 The ordered geometry of these patterns fit beautifully with furniture styles from the same period (Stickley, Mission Style, and, of course, Prairie Style). Also, these simple dynamic designs, with their natural colours, create striking accents for to-day’s contemporary interiors and furnishings. I’ve created 6 Prairie Style needlepoint seat cover/pad designs for you. Remember, they will also work as piano bench covers! You can see below how well these uncluttered elegant designs work well with diverse furniture styles. These iconic designs are timeless! Sage green background, with teal green, dark terra cotta-red and putty colours in the motif. or equally as an upholstered seat cover on a contemporary bench. Botanical elements of the Asiatic Ginkgo Biloba leaf join with the ordered geometry of the Prairie Style for a strikingly simple effect. and a symbol of profound endurance and hope for future generations (four ginkgos survived the blast at Hiroshima and are still growing today). Iconic Prairie Style design with geometric border in colours of soft greens, taupes and dark terra cotta. 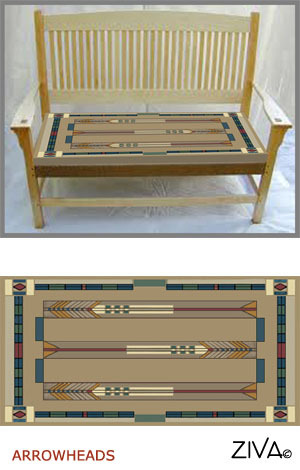 In the photo below right, the wood detailing on window bench reflects the square border design of the tapestry seat pad. If you like the GINKGO LEAVES design, but would prefer to stitch something smaller, why not look at the the GINKGO LEAVES CUSHION design! 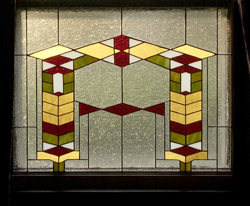 A truly western prairie flavour of horizontal stylized arrows; a pattern used a great deal in the stained glass windows in Prairie School architecture. The border continues the western theme with geometric bands and corner squares with lozenge-shaped or arrow-shaped accents. 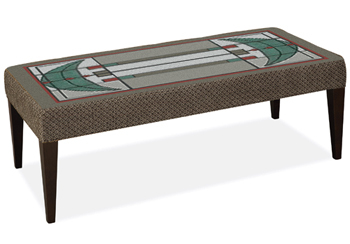 A perfect tapestry pattern as a seat pad for a simple wood seat bench, like the one in this photo! It would also work well as a window seat bench, with the border reflecting the architecture of wooden window frames from the period. Bold border design with bands of mid-sky blue and cool green with red accents. 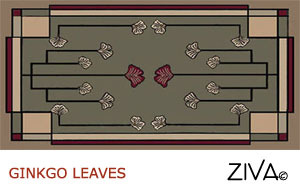 The central motif of 3 stylized arrows consist of deep red, gold and cool green and blue on a soft taupe background. Again this design is reminiscent of the stained glass designs that were very popular in this period. Two bold moon-shaped patterns at each end are balanced by a delicate tracery of black lines which create the square and curved contours of the rest of the design. 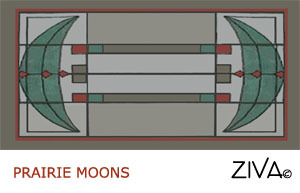 The cool green contours of the two large moon shapes are contrasted with geometric squares and diamond shapes in terra cotta and dark taupe. Background of light greys and taupe, with a terra cotta accent in the dark taupe border. 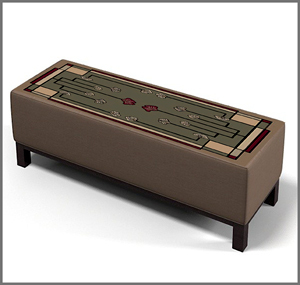 The design is successful both as a seat pad or upholstered as shown on this elegant contemporary seat bench below. This tapestry design is reminiscent of Navajo patterns, with a large central angular motif visually broken by a strong horizontal central band of rectangles and diamond shapes. 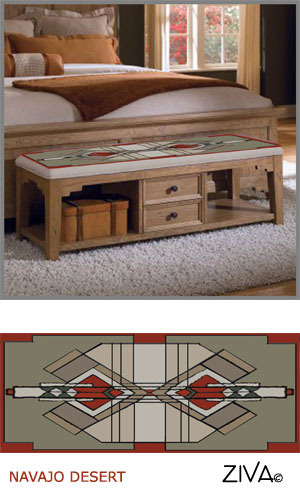 The border with rectangular accents reinforces the Navajo theme. This needlepoint seat cover design adds a dynamic yet elegant final touch to this contemporary bedroom décor, which is decorated with dark green walls with furnishings in warm natural colours. 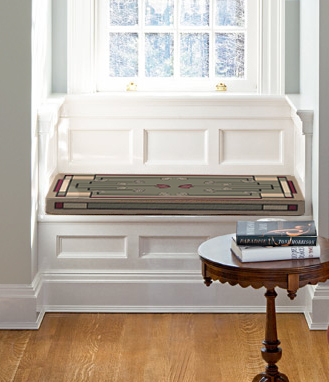 This is the boldest of this Prairie Style Collection, with strong terra cotta central motif, and border. The remaining colours in the pattern are muted taupes, dark sage green, and light warm grey. The background is sage green. 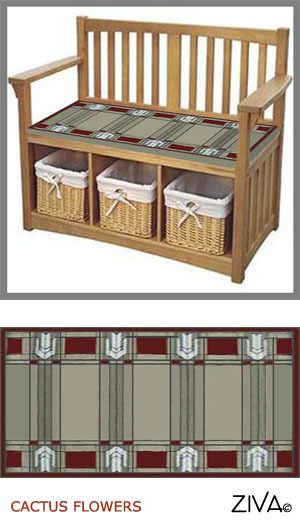 This is the only vertical design in this Prairie Style collection. The vertical stems of the cactus flowers are created by thin black lines, which provide a delicate tracery pattern throughout the repetitive motif. I love how well this Prairie Style seat pad coordinates with the strong vertical pattern of the wood back slats of the bench. 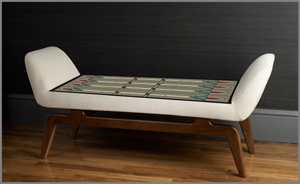 I think this design would also work well with a straight-legged piano bench as well. The light grey cactus flowers are separated by geometric squares and rectangles in deep terra cotta red. The background and flower stems are in tones of sage green, with black geometric lines creating the refined pattern. WOULD ONE OF THESE PRAIRIE STYLE DESIGNS SUIT YOUR HOME? 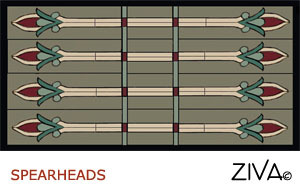 I have designed all but one of the above tapestries at a 2 to 1 ratio to give you an idea of the proportions; e.g. 36” x 18”. The only exception is the Navajo Desert design, which has a 2.5 to 1 ratio; e.g. 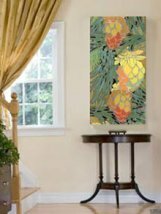 45” x 18”. But as you see from all the photos above, I can change the proportions and size to suit your seat cover dimensions. So please CONTACT ME with the design you prefer and the dimensions of your seat bench, and I will give you an itemized quote. All my hand-painted canvases are created individually, so I usually do custom sizes for furniture items. 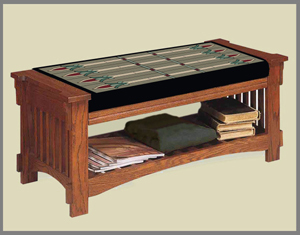 To get an idea of the price range for these Prairie Style designs with relevant sizes, click on the Shopping Pages for piano benches and needlepoint footstools . I’m looking forward to working with you on your needlepoint seat cover project! Just contact me and we can start! From these dynamic Prairie Style seat covers and pads, go back to the main Seat Covers page.